Carte de la Grece et de l'Archipeil. 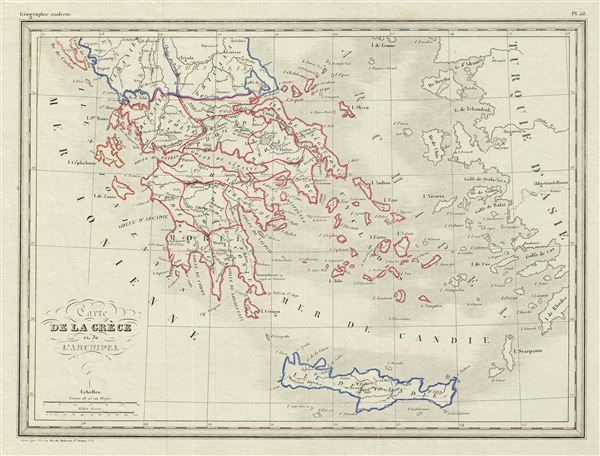 This is a fine example of Conrad Malte-Brun's 1842 map of Greece and the Archipelago. It covers Greece from Albania to the Island of Candia or Crete. Boundaries are outlined in color according to regions and territories. Several cities, towns, rivers, lakes, islands and various other topographical details are noted. This map was engraved by Thierry and issued as plate no. 38. Malte-Brun, Atlas Complet du Precis de la Geographie Universelle, (Paris) 1842.